Two Pack of Ratchet Style Load Binders. Color may Vary. Heavy duty load binder utilizes a ratcheting action to tighten tie down chains. The forged steel handle offers maximum leverage, while the cam and pawl design allows for easier and faster securement. All of our chain binders meet FMCSA and DOT specifications, and are stamped with the size, break strength, and working load limit on the handle. 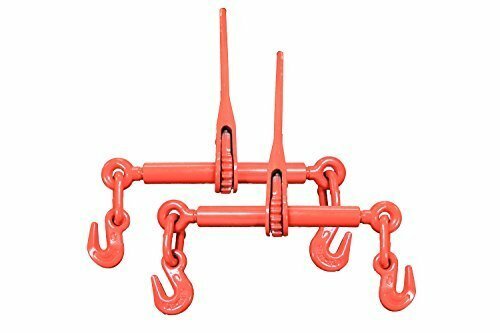 5/16" ratchet binders are made to be used with 5/16" Grade 70 Transport Chain. 2-PACK - Includes two ratchet style load binders. LOAD LIMIT - Working load limit: 5,400 lbs. LENGTH - Hook to hook length when closed: 24 inches. HANDLE - Total ratchet handle length: 15.5 inches. COMPATIBILITY - Designed to work with 5/16" to 3/8" chain. If you have any questions about this product by Professional EZ Travel Collection, contact us by completing and submitting the form below. If you are looking for a specif part number, please include it with your message.